There are an increasing number of cases of dogs getting sick from ingesting a common sugar substitute, xylitol. This substance causes no problems in people, but in dogs it can cause wild fluctuations in blood sugar, often leading to a severe hypoglycemia. It can also cause liver failure. Xylitol is widely used as a sugar substitute since it is as sweet as sucrose but has only one–third of the calories. It is a naturally occurring alcohol found in some plant material. It is extracted from birch wood to make the commercial product. 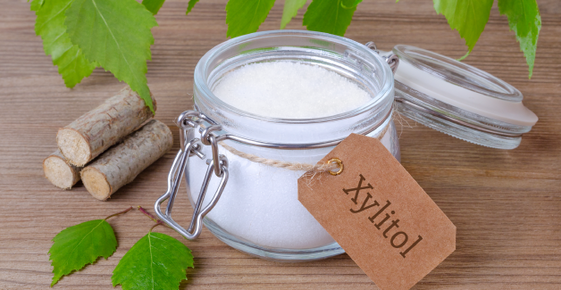 The types of items where xylitol can be found is increasing. It is common in sugarless gum, mints, and candies. It can be found in some foodstuffs, such as baked goods. It is present in some toiletries, such as toothpaste, mouthwash, and other oral care products, such as Crest White Strips. It is found in some over-the-counter medicines: nasal sprays, Flintstones Children's Vitamins, Beano liquid drops, and Nicorette gum. Some tube feeding formulas contain xylitol. Even some prescription medications, specifically Mobic oral suspension, Gabapentin oral solution, and Zegrid contain xylitol. Once a dog ingests xylitol, symptoms may occur in minutes to hours. At lower doses, hypoglycemia is common. You might notice the dog acting weak, staggering, unable to walk, or even seizing. At higher doses, it frequently causes liver failure. With this you may see a loss of appetite, vomiting, diarrhea, and jaundice. It does not take much xylitol to make a dog sick. Even one to two pieces of sugarless gum can cause disease in a small dog. The problem is that xylitol is not always listed as an ingredient on the label, or the amount of xylitol in the product may not be detailed. Often it is listed in "Inactive Ingredients," or "Other Ingredients," but sometimes it is grouped together with other compounds as "sugar alcohols", or it is not listed at all. Veterinarians and veterinary pharmaceutical companies are well aware of this problem, so this is not the source of problems. Dogs become sick when they chew up people's food, toiletries, or medicine containing Xylitol; the other common method of toxicity is when people pick up medications at a human pharmacy for use in their dog. This may be in commercial prescription medications (especially liquids, as they are trying to improve the flavor for people by sweetening their product), or in compounded medications. Always ask the pharmacist to look in their references to see if xylitol is an ingredient in a medicine before giving it to your dog. They undoubtedly will not know this already since it is not an active ingredient and this problem does not occur in people. Always consult your veterinarian before administering any medications to your dog. "New Findings on the Effects of Xylitol Ingestion in Dogs". Veterinary Medicine, Dec 2006' pages 791-797. Available to ship prescription medicine and food, as well as commonly needed supplies like shampoos and supplements directly to your door!